iPhone Screen 3.5" or 4" and beyond? | Johns iPhone | iPhone Blog with Help, News, Tutorials, Tricks, Tips, and More! 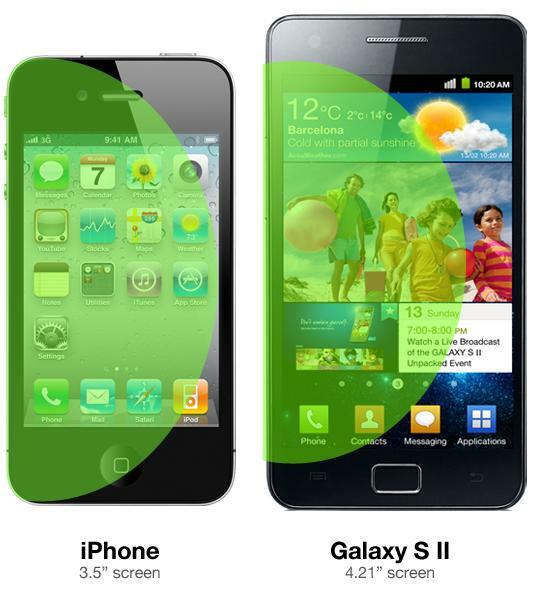 Home » iPhone » iPhone Screen 3.5″ or 4″ and beyond? There are a slew of new phones that have been released over the last few weeks. Almost all of which have gigantic screen sizes. Many of the phones are now supporting 4″ screens as the standard, but there are some that are creeping much further up the scale. Most notably for large screen sizes, the Nexus Galaxy has gone bigger than any other Android phones on the market. So big that one of the tag lines for the phone’s release, was “You’re going to need bigger pants”. While the screen is technically 720p HD resolution, the price of having a phone that is nearly 4.7″ in size seems too high of a price to pay. Motorola seems to like it’s current position of 4.3″ with the new release of the Droid Razr. Bringing back the most popular name for a cell phone that has ever been, was a good idea in my opinion, but I think they should have stuck to the essence of the Razr a bit more. While having it very thin is awesome, the size of it still makes for awkward use. But that isn’t really what is important. Lets talk about the iPhone. For me, when the 4S was released, I was initially very disappointed. Not having a bigger screen was kind of a let down for me. I wanted to see more of the retina display. I wanted a little more screen in my hand. At the time, I was giving a Droid Bionic the old college try, just to see what it was like. And when the 4S came out, I was fairly sure that the screen size was one of the reasons that I was going to stick with the Bionic. I liked having a nice large screen to see things on. But after a few days, I started to notice something. I couldn’t reach all the buttons. My hands weren’t big enough to reach all the parts of the screen. While this seemed negligible at first, after the first near miss with dropping the phone because I couldn’t get my hands around it. I realized that something was wrong. If I can’t use my thumb to reach all the buttons without nearly dropping the device, then the size is not for me. Maybe some have bigger hands, and this isn’t an issue, but for me, it was. I ended up with a nice 4S in my hand, and the first thing I noticed about the phone was how nicely it fit back into my hand. For the first time I started to realize why Apple has stayed with the same screen size for 5 years now. Because, like many of their other products. It works. It just works. And that is what counts. Holding the 4S from just about any angle allows you access to all the buttons and every inch of the screen. After doing a little research, I found a good visual representation to what I was experiencing with the phone. As you can see in the picture on the side, the thumb just generally isn’t long enough to get all the way across, but that isn’t the case for the iPhone. You can reach any point, at any time. Apple does it because it works. I should have known better, I shouldn’t have doubted. However, I have to ask, do you think there is a way that Apple could give us a bigger screen without having to pay that price? And if they did, would you prefer it?